Whether you grow flowers alongside or mixed up with your vegetables and herbs, or have no room for anything but flowers, they should be grown organically. Firstly because they are part of the whole garden environment (and your neighbour’s as well) and secondly because the flowers themselves will prefer it. The bees, butterflies and other insects that constantly fly to and fro will benefit from a chemical-free environment. We also know that chemicals can influence the scent and colour of flowers. In addition, as with herbs, artificial feeding can make the plants more susceptible to disease, and encourage leafy growth at the expense of flowers. As with your herb beds, the flowerbed is likely to be a long-term bed of perennials, perhaps interplanted with different annuals each year. So it will repay a thorough initial preparation. Since you are not going to be using weedkillers it is important to extract the perennial weeds, and to break up the soil so that it will drain well. You can then incorporate well-rotted compost to give the plants a good start. Like herbs, most flowers will not need very high fertility and an annual mulch of compost should be sufficient. Leaf mould would also make a good soil conditioner, though because it is low in nutrients, plants may also benefit from calcified seaweed and perhaps phosphates, in the form of fish fertiliser. Your flower garden could of course be purely ornamental and this in itself can be therapeutic, particularly if you choose scented flowers. The aromatherapists have shown us the specific benefits of particular scents, from calming lavender to stimulating rosemary. Even just sitting in the garden on a warm evening will allow you to experience these effects and, of course, growing your own flowers will provide you with the raw materials for your own preparations. However you could also choose your flowers with a view to other uses. A surprising number of flowers are edible. We are used to crystallised violets or rose petals, but a more healthy way of adding flowers to our diets would be in their raw state. Violas, pansies, pelargoniums and hollyhocks can all be added to salads. Borage and sweet woodruff can be added to summer drinks. Pelargonium leaves can be used in sponge cakes and rose petals can be used in sweet sandwiches. 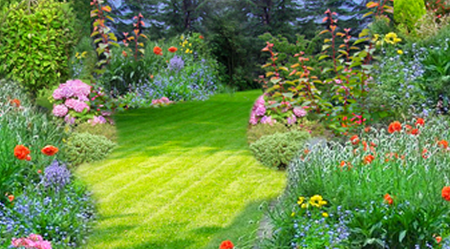 You could also create a flower garden specifically for wildlife. This will attract the bees and beneficial insects that will help the rest of your garden and also look attractive in its own right. There are many nurseries selling seeds of wildflowers that would encourage bees, butterflies or beneficial insects, as well as flowers whose seedheads will be popular with birds. Insects prefer the simple daisy flowers as the nectar is more accessible. So the original forms of flowers are often better than the more highly bred doubles. Bees like colour, particularly blues and yellows. Moths and butterflies prefer scent and paler colours, coming in the dusk to flowers such as evening primrose. From corncockle, convolvulus and coreopsis to salvias, sunflowers and sweetwilliam—there are enough to choose from to make colour-themed beds, or simply to create a riot of hues that will be your colourful contribution to the organic movement. How to activate iPhone ?